Artist Paedra Bramhall needs your help. 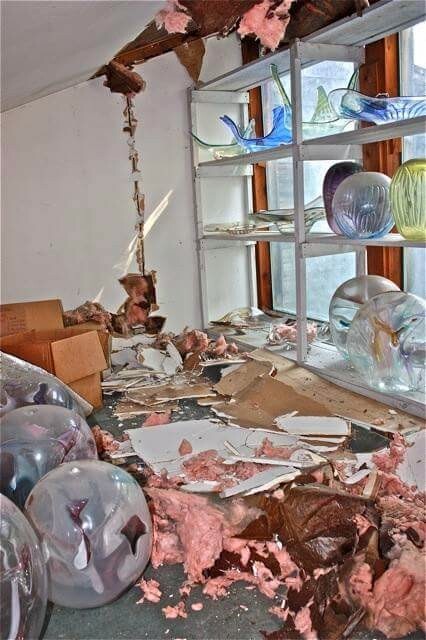 On September 9th, Paedra’s glass studio was viciously vandalized and burglarized. 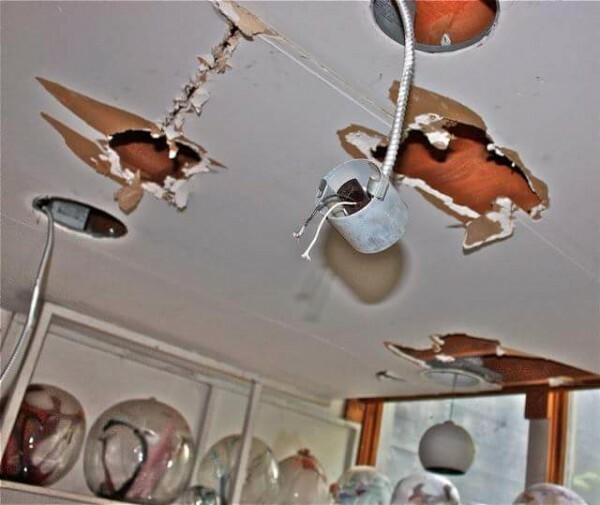 All of the electrical wires and most of the light fixtures were ripped from the ceilings and walls and the burners were stolen from the furnace. 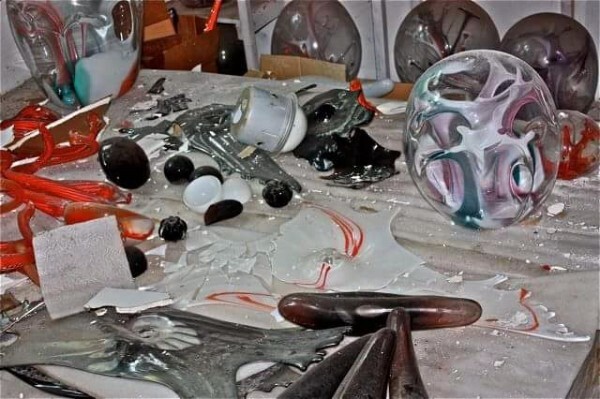 Paedra’s tools were stolen and, most devastatingly, some of Peadra’s stunning and irreplaceable art work in glass was destroyed (see images below). Paedra was unable to afford insurance on her studio, as it was too costly to insure while the furnaces were running. Paedra’s income is limited to social security. Whatever she earns from her art sales goes back into the cost of art supplies. 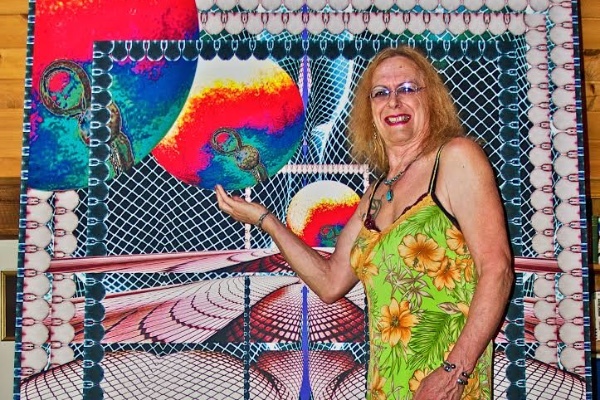 Paedra is a 75 year-old, transgendered Male to Female artist, who has had been out and proud for more than 20 years. A beautiful and important part of her artistic quest focuses on the sexuality of being female. She has been a full time producing artist in Bridgewater, VT, since graduating from the Cleveland Institute of Art in 1970. She has worked comfortably in a wide array of media from paper to glass to bronze to digital. Her widely collected blown art glass INTERIORS are like no other glass created by any other artist. She has created small to large scale bronze sculptures, that took years to complete. Paedra has worked on paper and most recently in digital media. Paedra’s lifelong commitment to following her vision has often meant choosing to live on the financial edge. Her art is her life. AND now she needs your help to make it possible to put her studio back into working order. ANY AMOUNT is tremendously appreciated! Paedra thanks you from her whole being!!! >To those who gave that I might continue. Thank you from the very quick the very core of my being. Thank you. You saw a need and without hesitation, you choose to help. You are friends. Some of you I have known for many many years. Some of you only briefly. Some of you, we are totally new to each other. So let me try and bring you up to the present, end of May 2018. This is a realization and an accepting of the reality of my life as it is now…… right now. > History of building/studio. Glass blowing studio since early 1980’s. I built the building with some help from friends and I did 90% of the work including electrical wiring. And I ran the high pressure gas lines from tanks to furnaces, And I did the building of the art glass furnaces and annealers/equipment . Much much much was my own sweat equity as that was the ONLY way I could afford to do in. I was young and full-of-it and strong then. I am not so today….. reality. Insurance was not was never possible due to the cost of $3500.++ per year due to possibility of fire. I never had a fire in all the time I ran a hot glass studio. > SO with this vandalism and destruction, it is all LOSS. And totals $19,000.00 +- This far exceeds what was raised from you dear wonderful caring loving friends in your attempt to bring this back to life for me. About 1/4 - 1/5 was raised. Also, I no longer have the mental strength or the physical stamina to do what I did 30+ now nearly 40 years ago. I am sorry to disappoint you in this way, but I just do not. I know this really disappoints some of you. I do not know what more to say to you. I very much hope you understand. This is very difficult for me to write. This has happened and this has changed me and in ways that have brought me to new decisions and focuses. I hope you are accepting of these. The shell of the building remains and is there to be possibly re-purposed. But it is just a shell. The above concerns directly the GoFundMe which you all are a direct part of. A part of me, which only a few of you know of and which I share here with you, which is rooted as deeply in my soul as is my art, is the stewardship of the acres which my mom left to me when she died. Since 1988 and much more focused in the past 3-4 years has been my work with the Northeast Wilderness Trust. This focus is so that 92% of which was gifted to me will be PRESERVED, will be Forever-Wild. This is happening !!! And this is the most important thing I have ever done in my life, going I feel beyond the importance of my art. I feel this to be my legacy. The following are two short videos, the first which I orchestrated and gave to the Northeast Wilderness Trust, and the second which Peter Block did on his own. They are 2+ min and 3+ minutes respectively. I hope the above answers your questions as to what is happening with Paedra and her art and how she doing. I will still make art. I still have years to live. Thank you for your love and understanding and help and for giving that my life may move forward.